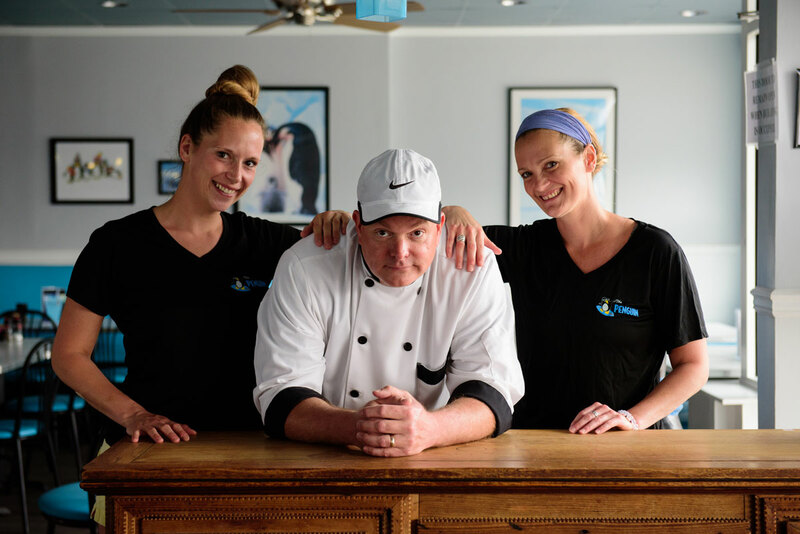 A restaurant named The Penguin in Bethany Beach serving original “Eastern Shore Cuisine” with locally sourced ingredients would naturally have its origins in a one-horse farm in…..Vermont! The story begins on Nutter Farm” nestled in the valley of Killington and Pico peaks. It was there that Katie Nutter McLeod grew up. Her family had bought the farm at the beginning of the 1900s. There Katie’s family raised everything from pigs to turkeys, beef cows to chicken, and planted three acres of sweet corn, potatoes, green peppers, several varieties of tomatoes, seedless watermelon, basil, mint and more. Katie weeded the endless rows and hilled the potatoes. On Saturdays, she helped pick the veggies that went to the Farmer’s Market in nearby Rutland. The farm was “organic” long before anyone would even use the term. That was just how they lived. When Katie’s children, Jen, Lee and Macky, came along, they too were recruited for garden duty. They picked potato bugs and rocks when little, eventually graduating to potato diggers and corn pickers. They “worked for their supper” and developed a healthy appreciation for the labor involved in bringing food to the table every day and the difference in taste from the store-bought variety. For vacations, the McLeod family stayed in the small coastal town of York Beach, Maine. Katie loved it, and years later, after nearly a half century in the mountains, she decided it was time to live by the ocean. After researching different beach areas, she discovered the Indian River Bay in Ocean View, three miles from Bethany. Along with Jen and Lee, Katie made the move in 2007. Long before Katie had ever even heard of Bethany Beach and far from Vermont, Mark Neumann, a Baltimore businessman, had been coming to the Eastern Shore for years. He and his wife Robin continued that tradition, vacationing as a family after the birth of their three children — Paul, Andy and Chloe. Mark always wanted to have a home and business there to retire to, and Robin, who teaches in the Baltimore area, loved the beach and the oasis it provided her and her family every summer. In 2007 the Neumanns bought a home in Bethany, and Mark soon after opened The Penguin Diner. One of the original hires was Billy Davis, Katie’s husband. He soon brought her to work there as well. Katie became a manager and then general manager. Jen and Lee had worked at a landmark restaurant in Ocean City, MD, since their arrival in 2006. Lee worked in the “light fare” kitchen, improving and reorganizing the system and greatly reducing ticket times. She was recognized as the “kitchen savant” at the ripe old age of eighteen. Jen worked her way up to head server at the front of the house and managed a very large staff. She always placed #1 in sales and also organized and executed all types of events, from weddings to birthday parties. The Penguin Diner was geared toward young kids, the focus of Mark’s own life at the time. Visitors will still remember the diner walls plastered with hundreds of penguin pictures drawn by the children diners. The menu was sensitive to children’s food allergies. They cooked in vegetable oil instead of peanut oil and offered gluten free meals for kids and adults. The little Neumann kids worked right along their dad every summer. Paul and Andy ran food and took orders and Chloe made drinks and cleared tables. But the darndest thing happened — the kids grew up! Early in 2015, Mark and Katie decided to join forces and partner. They changed the restaurant’s name to “The Penguin,” and injected some young blood with fresh ideas by making Jen and Lee partners as well. Next came a sleek remodel of the dining room. But the most important change came in the kitchen. Katie wanted to bring the organic, farm-quality food she grew up on to the restaurant. They resolved to build an upscale restaurant that serves healthy and delicious meals while also being sensitive to dietary needs. The partners hired the finest chef in the area, Jeff Faille from Berlin, MD, a good friend and old colleague of the McLeod sisters. In 2015, Jeff created a fine dining menu for dinner that showcased 100% organic, grass fed beef and cage-free chicken and farm fresh locally sourced fruits and vegetables. He also found an excellent local Maryland crab, fresh fish and seafood source that provides the restaurant with the finest and freshest local product available. With a tip of the hat to their Vermont roots the McLeods added Pure Vermont Maple Syrup and Cabot cheddar cheese. By the spring of 2016, the transition of the breakfast and lunch menu was also completed, allowing the Penguin to provide its unique Eastern Shore cuisine for breakfast, lunch and dinner. The McLeods and Neumanns would never throw the baby out with the bathwater so they kept what they loved: Kids’ art now graces the menu covers, and they remain committed to offering gluten-free items and still use only vegetable based oil.